This parking lot just sold. Has this been discussed in another thread? or Google "608 Broughton" to get the html version. I must remember to use this intrunet in future. I must confess, I'll miss the view of the backside of those Fort street shops once this lot is developed. I know. It always makes me homesick for New York. It's funny how few alleys we have in Victoria, though. 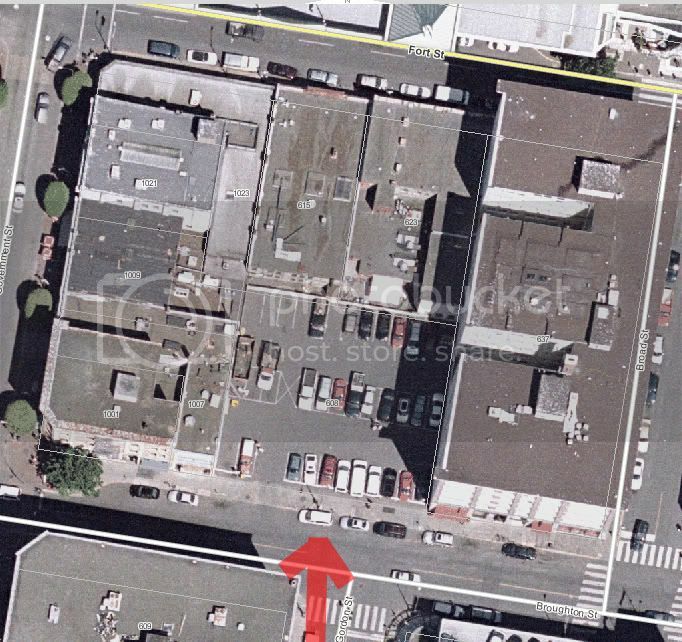 The backs of those buildings aren't accessible by a through-way, or are they? They're more like back courtyards -- at least it doesn't look like the space goes through to the East? That back alley view is one of my favorite in Victoria. The mix of ages of buildings, and styles are just awesome for contrast. I've also got a bit of a grit fetish, and that landscape represents one of the last really gritty urban views left in Vic. I'll miss it too. If any shutterbugs are down that way and wanted to take marvelous pictures of it as it is now, I'd be totally grateful. So here's the lowdown. Chard Development is proposing either a residential and commercial development or a boutique hotel and commercial development in an 11-storey tower. Lots of brick in this rendering. The design is reminiscent of the old office tower at Douglas and Johnson, no? 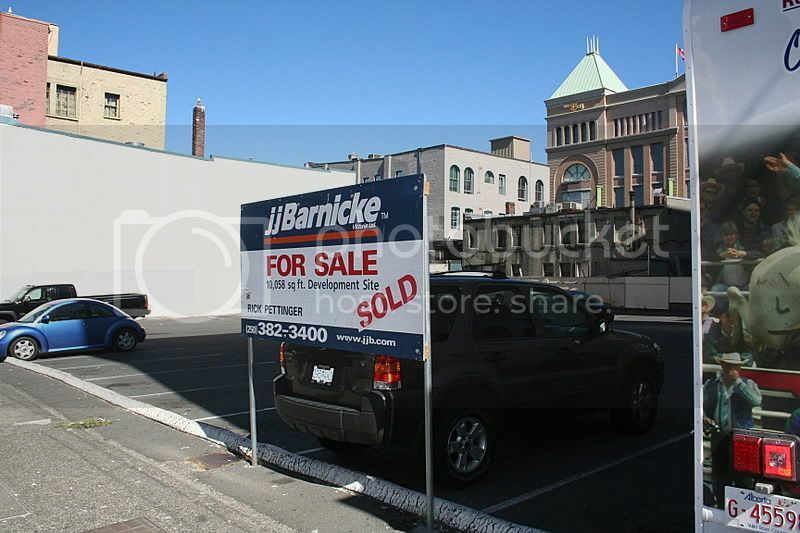 Interesting to note that two proposals are now coming down for the 600-block of old town, namely this one and Westbank's [url=http://www.vibrantvictoria.ca/forum/viewtopic.php?f=62&t=1452:ba82b]Ballantyne office[/url:ba82b] proposal. Either both get through the height/massing hurdles or both get axed since each project appears to be pushing the limits in that part of downtown. I despise insipid low-detail faux heritage (examples: the west side of the Eaton's Centre or the Hotel Grand Pacific). Is this proposal more of the same? A "traditional" building doesn't have to be boring and cheap, like so many people seem to think it does. It can be as detailed and beautiful as the genuine article. I'm all for fine retrospective designs, if they're done to a high standard and if everybody involved is clear as to what style they're trying to play on/reproduce*. I think Victoria would do very well to fill in the gaps in the old town with modern buildings in high-quality "traditional" dress. Conclusion: if they plan to do it well, then I'll be rooting for them like crazy. *Why not make the task easier by emulating one of Victoria's lost buildings? Not a hope in hell of going through. The ink is still wet on the Downtown plan and the first test of the oldtown design guidelines to come through wants to push the boundaries. Fat chance they will be roasted on the proverbial spit. The whole basis of height on that site is based on the Yarrow next door they will either have to shrink or forget building there. They could easily apply for a high density on the site as that will "fit in" but no height increase will be given. Geez, here I am worrying about the design like a silly goose, and meanwhile the whole thing's moot because it's ten feet too tall. I guess I'll never be a city councillor, what with my misplaced priorities. "Parking lots are preferable to nice buildings that are a bit too tall." "Parking lots are preferable to nice buildings that are a bit too tall." "Parking lots are preferable to nice buildings that are a bit too tall." Ahh you have discovered the oath sworn by Victoria city councillors when they take office. We will now have to kill you. Darn. Just as real estate prices might be starting to turn, too. Oh well, I had a good run. What's going on wid dis one? This should be public fairly soon. The developer is trying to work within the existing zoning guidelines. The top three penthouse storeys of this 11-storey residential building will be set back in a sort of half-moon shape, not as seen on the MCP listing. ^Thanks for the info, Rob. the half-moon thing sounds cool. 3 penthouse stories sounds like a lot for an 11-story building though. Are any current renderings available for this project?